$75.00 "Calendar of Notable Events, 76th 'Chernigov' Guards Rifle Division", circa 1945. $35.00 Badge of a Veteran of the Southwestern / 3rd Ukrainian Front, circa 1970s-80s. This Front (Army Group) played a key role in the Battle of Stalingrad. In excellent condition. $35.00 Badge of a Veteran of the Southern / 4th Ukrainian Front (formerly Stalingrad Front), circa 1970s-80s. In excellent condition. 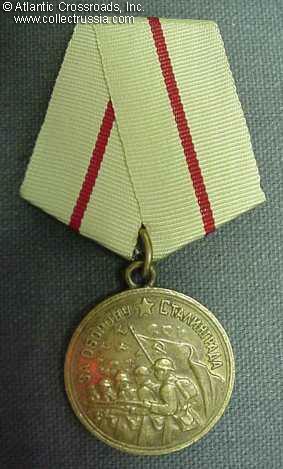 $30.00 252nd Rifle Division Veteran Badge, issued in 1970s, most likely to commemorate the 30th Anniversary of victory. The original unit was destroyed in the "Rzhev Meat Grinder" in 1942; its second formation fought at Stalingrad during practically the entire battle as well as the defensive phase of the Battle of Kursk. $40.00 Badge of a Veteran of the 64th / 7th Guards Army, uncommon and relatively early Moscow Mint issue, circa 1970s. In excellent condition. $80.00 "Great October 60 Years," 4 ½", 1977, porcelain medal commemorates the simultaneous anniversaries of the 1917 October Revolution and the famous Orshanskiy Fighter Air Regiment.